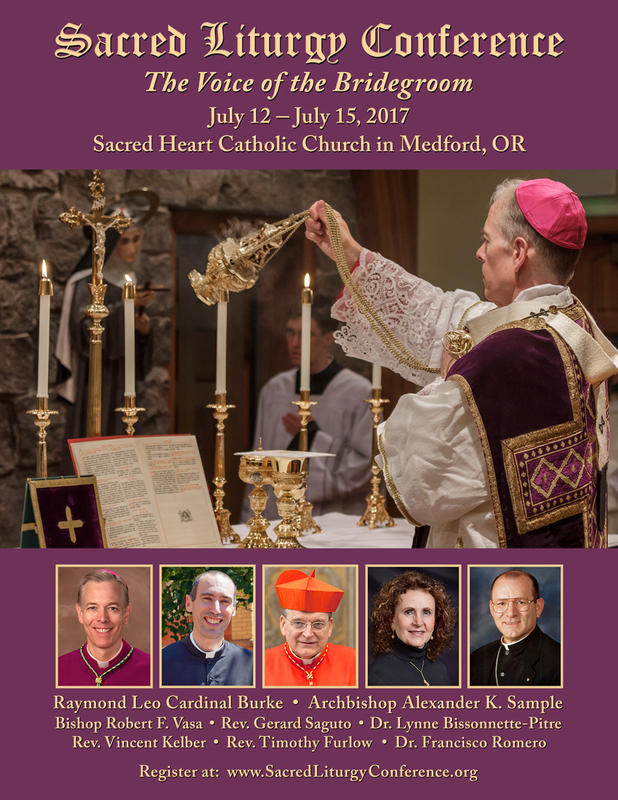 Registration is now open for the 5th annual Sacred Liturgy Conference scheduled for July 12-15, 2017 in Medford, Oregon. The conference will include eight lectures, five chant workshops, four sung liturgies, and from the way it is structured, will allow for plenty of time for fellowship and conversation. His Eminence Cardinal Burke will give a lecture and celebrate an Extraordinary Form Solemn Pontifical High Mass assisted by priests of the Priestly Fraternity of Saint Peter. Archbishop Sample will give a lecture and celebrate a Pontifical Mass in the Ordinary Form. Additional faculty will include Bishop Vasa, Rev. Gerard Saguto, FSSP, Rev. Vincent Kelber, O.P., Rev. Timothy Furlow, Dr. Lynne Bissonnette-Pitre and Dr. Francisco Romero. The conference is organized by the Director of Schola Cantus Angelorum, Dr. Lynne Bissonnette-Pitre MD, PhD, LGCHS and hosted by Sacred Heart Catholic Church in Medford, Oregon. This Sacred Liturgy Conference is open to anyone interested in the treasures of the Catholic liturgy and promises to be intellectually, liturgically and spiritually enriching. To find out more specifics about the schedule, accommodations, and how to register for the conference go to www.SacredLiturgyConference.org . You may also call 206-552-3400 or email sounavoce@gmail.com . I am told that space is limited and registrations will be accepted on a first-come, first-served basis. Below I have posted a link to a promotional video as well as a poster. If you can share the video to spread the word do so!